Groggy and spacey from lack of sleep, we stumbled through customs, followed signs, climbed and descended escalators, somehow finding our meeting place at Frankfurt’s international airport. Holding a “Frankfurt On Foot” sign, a man with a closely trimmed blond beard stood leaning against the wall. Dressed in stone washed jeans, white converse sneakers, and a windbreaker, Hondo introduced himself as our guide for our walking tour of Frankfurt. We were on our way to South Africa and with 9 hours in Frankfurt, sandwiched between two long red eye flights, we needed to stretch our legs. After reading positive reviews on Trip Advisor, I booked the tour with Frankfurt On Foot. 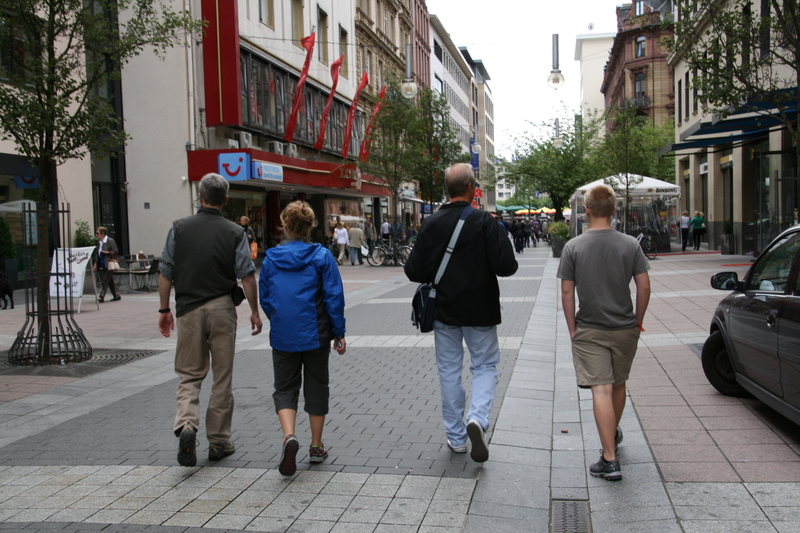 For 75 euros, an English speaking guide would meet our family of four at the airport, guide us around Frankfurt, then bring us back to the airport in time for our next flight. I emailed our arrival time to the owner, and confirmed our tour with no money down. After connecting with Hondo and storing our nonessential carry-ons at the luggage storage area (20 euros per bag for up to 7 hours), we put our faith in Hondo, following him through doors, down escalators and onto a train headed into downtown Frankfurt. For the next few hours, we followed Hondo around Frankfurt, learning about life in Frankfurt and Germany, listening to stories of the city’s history and seeing descriptions of the old and new. We wandered among numbered trees and shiny buildings, watched children playing in an outdoor fair, tasted sausage and shouldered our way through a crowded plaza. We had our pictures taken with the Bull and the Bear, glimpsed the city’s preparations for the Iron Man Triathlon competition, its bleachers and scaffolding unfortunately blocking our view of Old Town. We rode the street car, watched a beer party cycle past, visited St. Bartholomeus’s Cathedral and found Anne Frank’s name on the Jewish Holocaust Memorial Wall. We listened to stories of the city’s history, and its plans for the future. We ate schnitzel and hard boiled eggs with green sauce, bread with molasses and raisins, and those of us old enough, tasted the city’s beer. Eventually, we headed back to the airport, our heads swimming with information, our cameras full of photos, our feet and bodies ready to sit again.